When I was two years old, I had surgery on my right eye (that's OD for those who care) and I wore a patch for awhile -- over my good eye, to strengthen the weaker one. I've worn glasses ever since then. 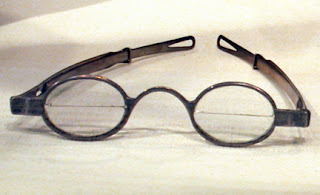 Yesterday I passed a milemarker: I got old: I now wear bifocals. The cool thing is, I don't mind. I like the idea of getting older -- I am finally starting to feel like an adult (at least on the outside). It is a new adventure in every part of my life: driving, reading, walking down stairs, anything that involves my eyes.